Each participant in the project was asked to simply sit for a portrait on first day of a dathun, a month-long meditation retreat. I photographed them against a consistent background. Prior to the photograph, I asked each person to consider what they were looking for in the practice period ahead. This was on day number one. Then, at the end of the program, after approximately thirty days of retreat, I asked each participant in the project to sit in front of the same background and asked each to consider what the experience of mediation retreat had been for them. 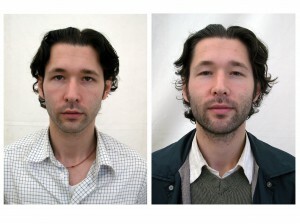 The result is the series of photos. It’s clear from results that the person in every one of the portraits has undergone an important transformative experience. I leave it to the viewer to draw their own conclusion. 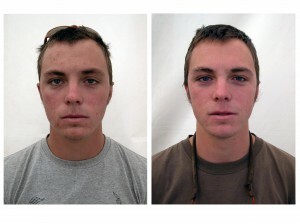 “Before and After” was one series in the larger project. Another was a series of photo realist paintings that explored the “moment” of meditation itself. Read more on the Shambhala Times about Dathun: Experiencing Retreat. 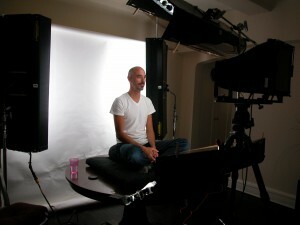 Join online talks about the dathun experience at Shambhala Online. Peter Seidler is an artist and change agent in an exceptionally wide range of environments. He currently organizes and coaches global creative teams and coaches individual clients to help them become stronger, more alive human beings. A student of Buddhism for more than twenty years, Peter has taught meditation since 2005. He brings insights arising from practice to his coaching clients, helping them recognize their own intrinsic brilliance. The qualities he constantly seeks to cultivate in himself, and to share with his clients, include creativity; transcendent wisdom, that which goes beyond our everyday experience; perseverance; love of learning; and appreciation of beauty. Peter’s art is included in public and private collections. He currently resides in Thailand with his wife Chananya, and their son, Orion. Very cool! One thing I notice is that their faces seem fuller and there is more color. Wonderful! Everyone attending a dathun has seen this effect, and of course it is apparent in the group photos of happy meditators at the end of dathun. 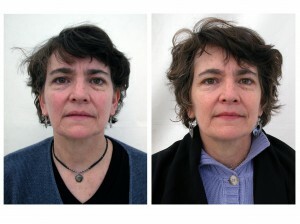 But these before and after photos really drive the point home. Worth 1,000 words or more. Thank you! This is lovely. I’ve always felt that people look different after a good stretch of meditation. Now you’ve demonstrated it. Art and science join hands in amity. Wow! What a difference. I notice a light or a glow emanating from their faces. This is nice, Peter, even inspiring. Sad to say, it sounds like people are taking your photos as evidence that hey, I really haven’t been wasting my time meditating — and who knows, maybe they have. Researchers need to be scrutinizing meditation, with all the experimental controls they can come up with, and with no assumptions whatsoever as to whether it actually works. Research should aim at finding whether meditation really brings about the results it ostensibly aims for (in the Buddhist scheme of things). For example, does frequent shamatha practice really “suppress” negative emotions enough to bring about consistent change in ethical behavior? Do the feelings of empathy aroused by tonglen really bring about consistent increases in altruistic bevahavior, or is it no more effective than singing hymns on Sunday morning or watching a good four-hankie movie? Notwithstanding a book some of us know about, or remarks by Dogen, it is the aims of meditation that one should focus on, not justifying meditation as an end in itself. Fantastic. The value gained from dathun is priceless…you can see in their eyes that their hearts have blossomed out. They look so beautiful! The pictures say it better, yes, than thousands of words could. As kind as they were before, you can see more softness, gentleness, kindness, and contentment after. I have been teaching Mindfulness Meditation as part of MBSR for several years and began to notice that around week 5-6 (of an 8-week course) people’s faces began to look different, more relaxed, more smiles, more open. Interesting to see that reflected in the photos here. That was a great Dathun. It rained almost the whole time and Acharya McKeever’s teachings were urgent and timeless. The first night of sitting there was such a fierce windstorm that the main shrine tent almost blew over – I remember at one point the lights over the shrine swinging violently and one breaking with a loud shatter. Mostly, though, I remember the respect I had for my fellow meditators, each courageously sitting with their own individual struggles and humanity, and yet reliably drawing on what proved to be an endless resource of grace and generosity towards each other. What a time! I love the glow from their faces. I call this “retreat face”. Lovely. This is really cool – what a great idea. To me, the biggest difference is in the eyes. One suggestion: the contrast is noticeably higher in most of the “after” pictures, making them look more colorful and vivid; many of the “before” pictures are flat and gray by comparison. Would it be possible to work with the pictures so that the only thing different is the practitioners’ faces? They appear more bewildered in the first series and more human, more reflective of basic goodness, in the 2nd set. RE: Steven D’s comment: I’ve never heard anything in the teachings that tells us to “suppress” negative emotions, but rather to gain awareness of them, experience their energy as we apply compassion, and work with separating the thought stream and seeing how it fuels them. Suppressing emotions is not healthy (though maybe healthier than acting-out) and I’ve never heard that endorsed in Shambhala. Peter, thank you for making the truth of dhatun obvious for all to see. And most of all it is good to read that you are doing well and still helping so skillfully. Just lovely Peter, lovely. Maybe you could post the whole show for us – pretty please? This was very enjoyable, Peter. I think it took a certain strength of character and insight to follow this through. Wow. This is such an interesting project. I’m ready to find a quiet spot to start my meditation…I’m feeling a bit like the pictures on the left lately. I’m sorry – this is nonsense. I’m not remotely surprised that these people looked a little less relaxed and happy in the *first day* of a strange, new experience, and that they looked happy and relaxed at the end of it. They were probably familiar with the photographer by then, apart from anything else…. People will simply apply their own prejudices to his ‘experiment’ – it has no objective value whatsoever. Good job manipulating lighting conditions. This is just like those before an after shots for acne products. 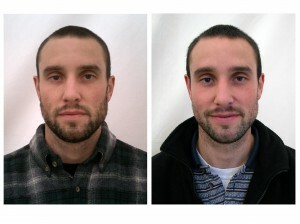 I will say that in all of the “after” shots the subjects look sleepy. That is great if they are all sufferers of insomnia; otherwise it it pretty pointless. For the experiment to come full circle we need to see what they look like after one month back in the ‘normal’ world with all the stresses and strains – can they retain their glow? Sorry to hamburg you all – but the photographer just used different focal lengths on the camera. Telephoto on the before to flatten the faces, a wider angle lens on the after. This changes the proportion of the face elements. I suspect the skeptics have never sat a retreat, while those of us who have might relate to the subtle softening of the “self” (as reflected in the post-retreat faces) that intense, contemplative practice can bring. No matter. Thank you for your project Peter, it made my morning. 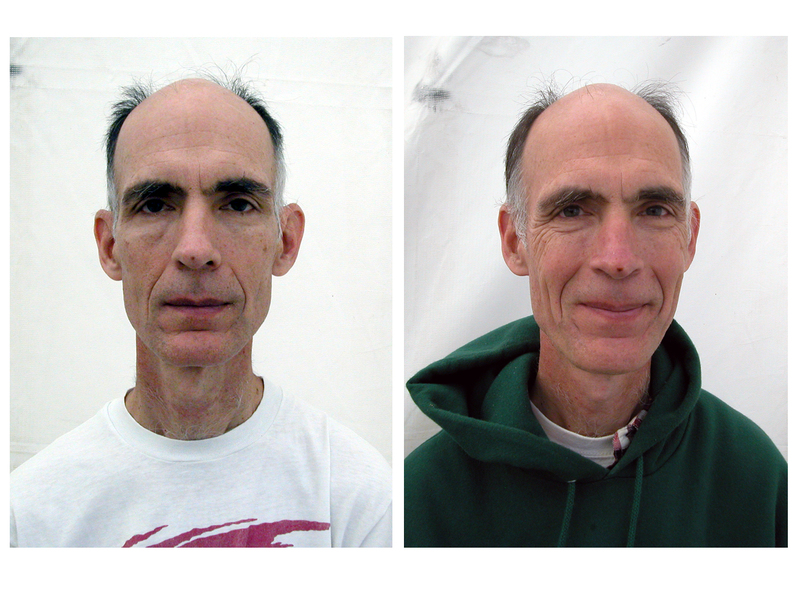 the “before” faces appear to be harboring more muscle tension; in the “after” photos the faces appear more relaxed, at peace… (the differences in contrast between the photos notwithstanding) Thank-you for being the catalyst of a great conversation with my children about the effects of meditation! I think the results would be more dramatic if the subjects were wearing the same clothes. In some cases it looks like perhaps days took place between shots. That said, I do believe that there are profound differences on many levels after periods of meditation. I just don’t think this experiment reflects that. They had to eat for a month as and it was probably vegetarian, so you should mention that as well! Diet will change appearances also. I’m not questioning the benefits of meditation, just noting another aspect. They look rested and full… or is that empty? Love this thank you. Nice photos. 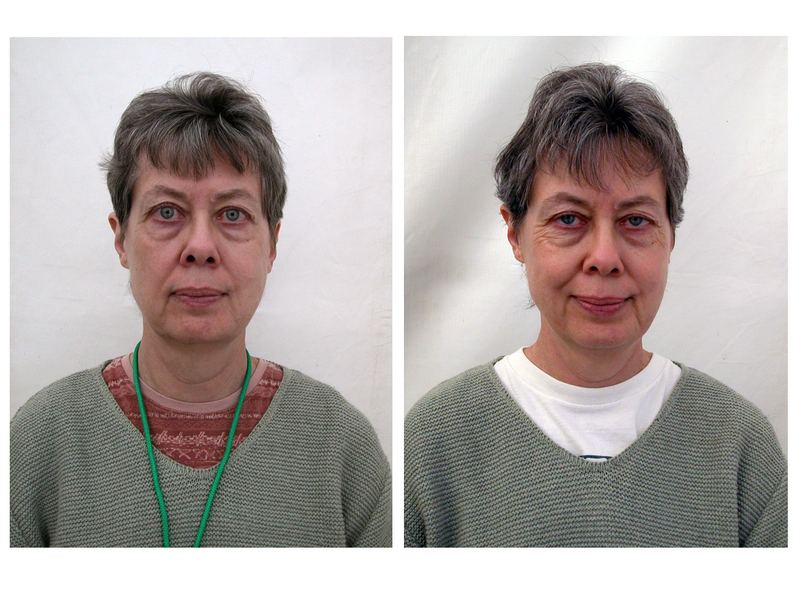 I have one more thought: It is possible that the people look happier in the after photos due to the camaraderie resulting from the month long interaction with other people in an empathetic atmosphere. Did the idea for this project come from the before and after photos of crystal meth addicts? That project had very similar and striking photos, as well, but in reverse. 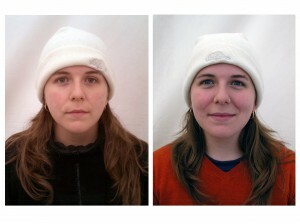 I could produce this before-after effect by pressing the “auto-retouch” button on my iPhone. I really love the idea of this series and agree that there ARE obvious differences in the subjects but also agree with the folks who voice disappointment that the shots are so obviously manipulated…different lenses, different lighting, and a lot more sharpness/contrast on the “after” shots…this fakery distracts from the truth of the subjects…next time just use the same lighting and lens set up and let the eyes and faces speak for themselves Peter! Beautiful, beautiful, heart-mind connection established to one degree or other. Yes! Our bodies are sacred, the ultimate expression of our spirit. Very profound. It is hard to exactly describe the difference, but I feel a deepening, a slight settling in myself when I observe the photos. Thank you. Thank you for the wide range of comments. I have noted elsewhere there were inconsistancies in the setup before and after. I used a different location, the weather was different and it was a different time of day. In some cases I used a different camera. There was however no retouching of the faces whatsoever. This art piece arouse out of curiosity and was not particularly posited as a scientific project though I believe it does lay the basis for one. Ah, if only that had been my experience of dathun. I may have looked considerably worse at the end of mine. Seriously though, did you photograph anyone who didn’t feel they had had a transformative experience, or who felt they had failed to connect with a practice they had somehow or other been led to believe would “work” for everyone? It seems hard to believe that everyone had such a positive experience. Interesting, and quite entertaining. 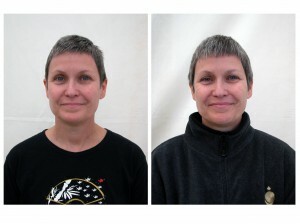 More meaningful than before and after dental photos. But I supect that those who need major dental work might think otherwise. Thank you so much for doing this research and offering these photos online. it is a joy to see the transformation of these meditators. As people have said, a picture is worth a 1000 words. Their faces look so much more relaxed, and full. their eyes so much more open and curious. Bravo for making this available to people. Before many meditation programs I have thought, we should do a before and after photo but always opted for the after photo because most of us are so stressed out before a program, it is painful to witness let alone photograph. These photos communicate that beauty is coming from within. Nov 17, 2011 : 10. READ. LOOK. THINK. | Jessica Stanley.